You’ve successfully interviewed, you’ve wowed the hiring manager, and you have an offer for a new job. It sounds wonderful to be able to have the opportunity to start the next phase of your career, and it is terrific that you were the candidate who was selected. But, what if you’re not sure that you want the job? If your gut or a little voice in the back of your head is saying, you’re not sure you should accept the offer, step back and take some time to consider whether you do want it before you commit to the employer. One of the worst things you can do is to say “yes” and accept a position that you’re not sure you want. It’s awkward if you change your mind and decline after you already accepted. It’s even worse if you start the job and decide you hate it from the outset. It’s much harder to undo something than it is to take the time to be sure. If you’re not sure that this is the right job for you, or if you’re juggling multiple job offers, the best thing to do is to try to buy some time to make an informed decision before you accept. Take the time to analyze the offers before you decide which one to take, and which one to turn down. It’s also fine to decline right away, rather than dragging out the process if you don’t believe the job is a good match. When you’re offered a job, your response doesn’t have to be immediate. The employer may expect you to request time to consider the offer or to make a counteroffer. Don’t feel like you’re on the spot and have to say “yes” —​ or “no” —​ right away. It’s important to be careful about how you ask for the opportunity to think it over. You don’t want to insult the hiring manager or lose the offer because you didn’t respond promptly. The best way to handle it is to start by relaying your thanks and appreciation for the job offer. Keep it positive and professional, reiterating your interest in working for the company. There are a few options for buying some time when you’re not prepared to accept immediately. An employer may contact you by phone or email or could invite you for an in-person meeting to offer you a job. It may be your dream job, and you may be ready to accept on the spot. In most cases, it’s a better idea to carefully evaluate the salary, benefits, perks, job responsibilities, and whether this is the direction you want your career to move in before you accept. When you receive the offer, it’s acceptable to ask the employer if there is a deadline to respond to the offer. However, preface your question by relaying your thanks for the opportunity. If there’s a deadline and it doesn’t seem like it’s enough time, ask if it’s possible to get an extension. Either way, you’ll know exactly how much time you’ll have to get back to the hiring manager with your decision. Another option for gaining extra time to decide is to ask questions. It may take some time for the hiring manager to get back to you, and it will help you clarify any concerns you have regarding the offer. It’s important to know about the compensation package in its entirety —​ salary, benefits, vacation, pension, and perks. You will also need to know when the company wants you to start so that you can plan a transition from your current job to the new one. That will factor into your decision making, as well. If you’re not 100 percent sure you want the job, consider negotiating the compensation package, so you’re sure the position is the right fit for you. There are many parts of an employment offer that is negotiable, in addition to salary. You may be able to negotiate an offer that will make you feel more comfortable about accepting. When you start the job may be negotiable as well and having extra time before you join a company may make your decision easier. Review these tips for negotiating a start date for a new job. There are some things you shouldn’t say when you’re looking for an extended time to contemplate a decision. Don’t lose the offer because you were rude or abrupt when you got it. Even if the money isn’t enough and the job isn’t what you want, be gracious and appreciative when you decline. Nobody likes to be rejected, and that includes hiring managers. I don’t know if I want the job, I’ll let you know. I’m not sure, I’ll think about it. I thought the job would pay more. I don’t like the position or hours. If this job isn’t a perfect match, but you like the employer, there may be another position available that you’d be interested in. Keeping the conversation positive will open the door to those future opportunities. Negativity will probably knock you off the potential hire list. It’s important to note that you shouldn’t wait too long to decide whether to accept or reject a job. Most job offers aren’t open-ended, and you don’t want to risk losing yours by procrastinating or waiting too long. It’s also important to respond to the employer right away, even if it’s to ask for more time. Ignoring the offer while you figure out what to do could cost you the position. 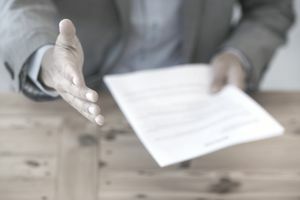 Keep in mind that if you don’t respond promptly, the company could withdraw the offer, as some parts of the offer (a hiring bonus, for example) could be time sensitive and could expire, or the employer may need someone who can start by a specific date. If you don’t have the availability, you may not get the job. Do take the time to be sure the job is the right one for you, but don’t spend too much time deciding. Most employers like to fast-track the hiring process, and delays make it difficult for everyone.